The tube-up design of the N30i is adapted for active sleepers. Patients can sleep in any position without compromising seal or comfort. The snugly fitting Spring Fit frame, carefully engineered septum bridge and tube-up design with 360° rotation capability keep pace with every twist and turn. If they get up during the night, the quick-release elbow keeps life simple. 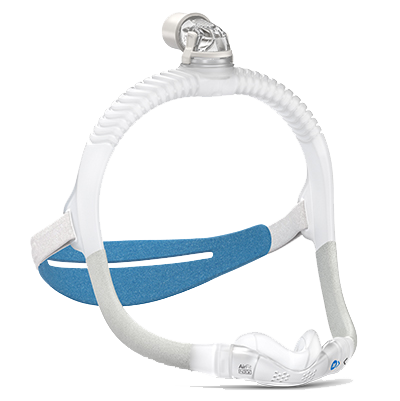 The AirFit N30i nasal cradle mask has a streamlined setup design to minimise fitting time and stock management. Fitting is fast, easy and accurate. Two frame sizes and two cushion sizes deliver a good fit for the vast majority of patients¹. Two extra cushion sizes provide an option for everyone. Simplify your logistics and help your customers to feel cared for and comfortable. As well as being easy to integrate into your business, the N30i allows you to expand your service offering. Active sleepers, belly sleepers, reluctant patients, patients with sensitive skin on the nose: the N30i is an attractive option for anyone who finds it difficult to comply with therapy using a traditional mask. ResMed external fitting study of existing 37 ResMed and non-ResMed patients, conducted between 09/04/2018 – 20/04/2018. Data on file; ID A4327753. The EasySpeak mouthpiece enhances comfort and freedom for patients using an Astral ventilator. Compact and lightweight nasal pillow mask designed for use with AirMini™ CPAP machine. The AirTouch™ F20, ResMed’s softest mask ever, features a revolutionary ResMed UltraSoft™ memory foam cushion that conforms to the unique contours of each face.